This is a book review of A Guide to the Good Life: The Ancient Art of Stoic Joy. Let me start by saying that I am a blank slate when it comes to philosophy. When I was a younger man in my twenties studying engineering, philosophy always seemed like a strange thing to pursue as a hobby or education path. Philosophy was the joke major for people who couldn’t do physics and math. As I’ve added another decade of life and experienced times of helplessness, rage, sadness, joy, and ‘life’ in general, I’ve changed my thoughts on philosophy’s utility. The need for a frame-work of living, interpreting, and perceiving the world was something that I had always simply invented as needed. I often fell short. I am analytical, so faith-based systems have been a hard sell. Based on recommendations from friends and inspired by the cool quotes I read from famous Stoics, I purchased this book shortly after my disease recurrence in 2014. If you don’t want to read further, my conclusion is that this book is worth your time and is easy to digest. It is an introduction to Stoicism, and contains practical guidelines to applying it to modern life. The first few chapters simply give an overview of the history of Stoicism, the major cultures and players involved in its development, as well as its philosophical lineage. That’s all well and good, but I like actionable information. So instead of running down the book’s contents, I’ll list several passages that resonated strongly with me. If they make sense to you as well, then you might enjoy this book. This is called ‘negative visualization’ and revolves around contemplating, but not dwelling on, bad things or the loss of things we hold dear. This serves to weaken the blows of bad news when we get it, and allows us to cherish the things we already have by stepping back to consider how it would feel if we suddenly lost them. It’s a way to keep from taking things for granted. The next concept of use is the Dichotomy of Control (Which the author breaks into a trichotomy). It’s simply the understanding and acceptance that some things are simply outside of our control. As someone dealing with a major illness, you can imagine why this one is important for me to learn and embrace. Worrying about things that we have no control over is futile and a waste of energy. It is about the process and self-improvement, NOT about winning the game. Fatalism. Things that have happened or are happening are beyond our control, as it was fate. Accept that. You can’t be anywhere but where you are right now. Self Denial. Anyone who has ever studied Jiu Jitsu or any other combat sports understands the value in this idea. Same goes with intense exercise, or even not turning your A/C on for a week in the height of summer. Putting yourself willingly into a crucible to be tested, though it’s not required of you. Shut down facebook for a month. Go a few days without eating. Sleep in your car. Doing something uncomfortable makes the comfortable thing special again. Meditation. Reflect on your successes and failures in your personal philosophy regularly and adjust course as needed. 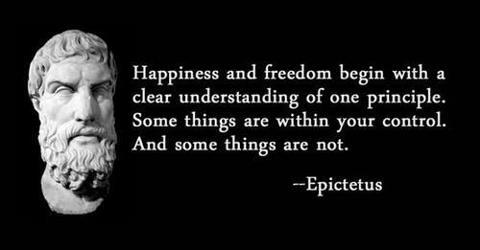 Those are the basic ideas behind Stoicism as outlined in the book. I feel that the author simplifies them and explains them in a way that makes sense to a modern person. He also addresses the counterpoints and holes in the philosophy. I appreciate that. The remaining half of the book contains advice on social relations, grief, anger, personal values, becoming a modern stoic, and a good bit more. I realize this isn’t a standard ‘gun blog’ post. But ultimately we are all humans on the same ball of dirt and will have similar struggles and questions. If you’ve ever felt lost for a way to navigate this life, and if you want a place to start looking, this is a good book. I don’t expect that I can implement all of the Stoic beliefs, but I know I can work on some of them. Previous Previous post: Brandished Gun In Traffic: What Would You Do?